WHY are B-town BIGGIES NOT SUPPORTING Kangana's Manikarnika? Multiple National Award Winning Actress Kangana Ranaut has added a new feather to her cap by starting the year 2019 with her directorial debut, the magnum opus Manikarnika which broke several box office records and is on its way to becoming a milestone in Indian Cinema. In its second week itself, it has registered itself in the 100 crore club. 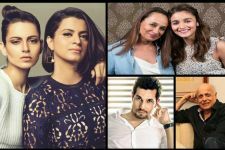 However, Bollywood is silent and no A-listerBollywoodd celebrity has come out and given their feedback or congratulated Kangana on making an epic film on one of the most historic characters of the country. In a recent interview when Kangana was asked about Bollywood being silent with respect to Manikarnika. 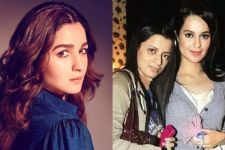 Queen, which released in 2014 was a pioneer in women empowerment and its success and Kangana's performance sparked a debate in the film industry and beyond on women headlining films and increased roles for women. Kangana Ranaut took upon herself to support fellow actors and good cinema, in her own words "I even sort of cancel my shoots and make sure I attend them(screenings). Now, I have stopped because it's getting too much," says Kangana who has always been there to support cinema. However, the industry has been silent on Manikarnika despite the importance of the subject and the iconic figure Martyr Queen Rani Laxmi Bai for India. Like how Queen was a landmark for Women Empowerment, Manikarnika has sparked a rise in Nationalism. On the silence regarding this magnum opus on Nationalism Kangana questioned, "How do these people become so petty? How do these people look at a movie from an individual's angle? How do they do that? How does it even work? For me, this is a revelation that this film, what Rani Laxmibai has done, is this freedom only mine? Doesn't it belong to anybody else?" Actors who support women empowerment and raise issues didn't seem to have the time to watch or support Manikarnika, despite it having national importance and it's a film appreciated by the people. On being asked if she has ever reached out to someone for watching her films like how others have reached out to her for their films she affirmed that she has but she was surprised by them not reacting to it at all. "But they don't have time for any of my trials. I have two-three films coming up, but I don't expect people to write about them. But Manikarnika is a film for everyone, this should get the attention of every Indian. This is a very strange sort of a racket. I don't know what they are threatened by," Kangana remarked. While the entire internet is talking about like what is wrong with celebrities talking about women empowerment for hours but will turn a blind eye and a deaf ear on a film about the same. Kangana remarked how she feels that nepotism has hurt the Industry below the belt. She stated she always praises good films like recently she praised Badhai Ho, Stree, Uri. "This sort of ganging up of the industry is really cruel which I can't even defend" she Concluded. Kangana Ranaut's Manikarnika is a biopic on Rani Lakshmibai and is running strong in Theatres crossing 100 cr Worldwide in just 10 days with a strong word of mouth and audience has been raving about her performance both as an actor as well as a Director. she is a psycho and arrogant woman...the way she talk as if its the whole bollywood should be grateful of her presence. It's called a pyrrhic victory. Even if the movie is super hit its a personal loss for her. Aint nobody wanna deal with her.